The many ways you can help Interfaith Sanctuary! 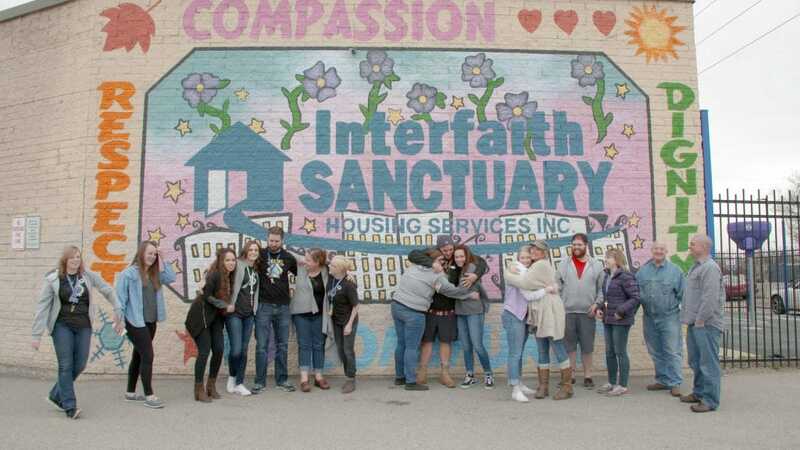 Interfaith Sanctuary began as a community response to homelessness. From our opening day in 2005, volunteers, donors, and supporters have been an integral part of our work. Members of our community give to Interfaith Sanctuary in so many ways, through volunteering at the shelter, providing in-kind gifts, hosting events, and offering monetary donations. All are vitally important in meeting the needs of those experiencing homelessness. Our shelter on River Street houses up to 164 men, women and families with children each night of the year, and provides over 55,000 bed nights and meals annually. Without the support of our local community, we would not be able to continue saving lives and rebuilding futures. By working together, we can get homeless people out of the shelter system and back in the community as a vital citizen. Whether you’re a faith, civic or service organization, we have numerous opportunities for you to meet your mission goals and positively impact the lives of our less fortunate Boise neighbors, children, and families. Each week there are 40 volunteer shifts available at the shelter. By volunteering either as an individual or a group for these hands-on work shifts at the shelter you help us maintain our low staff numbers and economical budget and provide a better nightly experience for those staying at the shelter. Your work experience may include welcoming and checking in guests, answering the evening phones, serving meals, or morning cleaning. Monetary donations to Interfaith Sanctuary are so very important, they are imperative to help us meet our annual operating costs and keep our shelter open. Now 100% of our budget comes directly from local individual donors, faith-based organizations, and service organizations. Designate Interfaith Sanctuary as part of your annual budget and contribute a once a year gift or commit to monthly giving. Fund our work through your group’s social justice/action committee or benevolence fund. Hold a designated offering or collection for Interfaith Sanctuary quarterly or yearly. Commit your organization to “owning” a part of Interfaith Sanctuary, your community shelter, by selecting a month to pay the monthly mortgage of $500 and become a part of our permanent giving tree mural. Interfaith Sanctuary is looking for groups or an individual to adopt a night for a simple, protein-rich meal for our guests. If you want to help us, please contact Morgan to schedule a meal donation! Saturday and Sunday are our “no meals” days, as Life’s Kitchen does not bring soup on those days. One local teenager made chicken and veggie cups-sort of a portable chicken pot pie meets a stew, a huge hit with our guests and we got the recipe if you are interested! We always hope a group will adopt one night during the weekend. 15-year-old Maloree Barbera along with her brother Luke, were concerned about our homeless population. They wondered if they were getting any warm meals. Maloree decided she would create this delicious recipe that combines chicken, potatoes, corn and cheese and serve this meal in easy-to-transport cups. We want to share her Meal-in-a-cup recipe and invite others in our community to help us bring creative, delicious, nutritious meals to our guests at the shelter. – your cups are ready to feed those in need! Another economical idea is to do burritos with chicken and rice or big batches of a healthy soup with a protein in it. We ask for 200 servings, please. Your organization can pursue opportunities to serve, learn about, and advocate for homeless members of our community. To support our guests you can organize supply drives, provide monthly meals, participate in our adopt-a-family and holiday gift drives, design your own service project, host a fundraiser, or designate monetary donations. (More details about many of these ideas are elaborated below). To pursue educational and advocacy programs about the issue of homelessness, faith groups can plan a service or create an educational presentation at your meetings (adult/youth groups, social justice or community outreach ministries). Civic and service groups can plan a meeting around the topic to educate your members. In both cases, we can work with you to schedule a shelter tour for your group and provide an educational presentation. Please contact us for more information and to discuss your organization’s mission or ministry goals. Providing in-kind gifts, particularly those items on our master supply list (such as dental hygiene, razors, and diapers) means our operating dollars typically spent on those items can go directly to running the shelter. Supply drives can be organized at houses of worship, in the workplace, civic clubs, and as an alternative giving the option for holidays or birthday parties! See what we need here. Barbecues, picnics, and holiday dinners are all greatly appreciated by our guests. They help to “normalize” life while living at an emergency shelter. We also look for entertainment opportunities such as cultural or musical evenings which add life enrichment for our guests. We greatly appreciate our friends in the community who host fundraising events to benefit the shelter. This is a great way to increase awareness about homelessness in our community. If you’re interested in hosting a community benefit for Interfaith Sanctuary, please contact us to discuss how we can lend support to your event. With advance notice, we can provide a Sanctuary representative for your event, along with public relations materials. We can promote your event through our electronic newsletter and social media. If you are planning to host an internal fundraising event for employees or at a house of worship, we’d be happy to schedule a shelter tour to help kick off your event. Each year in December, the Xtreme Holiday Xtravaganza, a Curtis Stigers/Jodi Peterson Production, is hosted at the Egyptian Theatre. Not only has this concert become a beloved holiday tradition, but all proceeds benefit Interfaith Sanctuary. You can support Sanctuary just by attending and bidding on auction items. Donations of auction items are needed, such as professional services, dinner certificates, experiential adventures, or vacation getaways. Interfaith Sanctuary’s Annual Home Sweet Home Gala is each year in September. Plan on attending this amazing evening of delicious food, special awards and fantastic music and dancing. To learn more about all of our events sign up for our newsletter here. Contact Morgan to get any information you need, discuss your ideas for getting involved, and start on the path to service. Thank you for your support. We couldn’t do it without you!